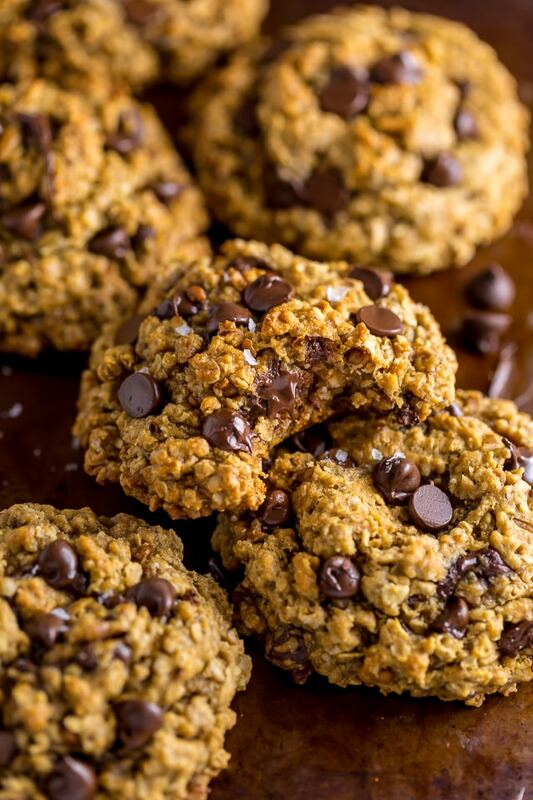 This recipe for thick and chewy Vegan Oatmeal Chocolate Chip Cookies is sponsored by Stevia In The Raw®. It’s the most wonderful time of the year… because it’s (unofficially) COOKIE SEASON! 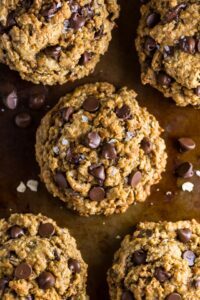 To celebrate, I’m sharing with you one of my most requested recipes: vegan oatmeal chocolate chip cookies! And after careful testing and tweaking, I can confidently assure you this the only recipe for vegan oatmeal chocolate chip cookies you’ll ever need. 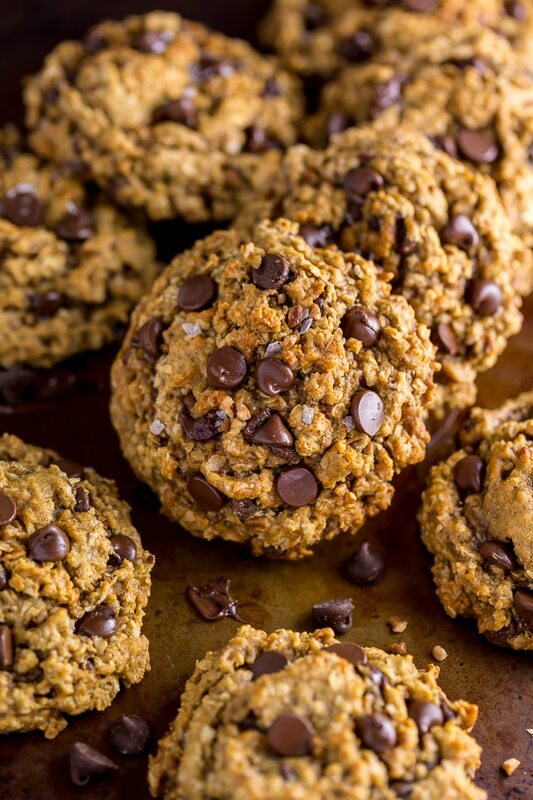 Crunchy, chewy, and exploding with gooey chocolate in every bite, these cookies truly have it all! But wait: there’s more! I was able to majorly lighten the caloric price tag on this recipe thanks to Stevia In The Raw® Bakers Bag. This recipe calls for equal parts granulated and brown sugar – so I replaced all of the granulated sugar I would have typically used with this fabulous zero calorie sweetener made from extracts of the sweet leaves of the stevia plant, and guess what? You can’t tell the difference! Like, not even a little bit. And swapping in Stevia In The Raw® Bakers Bag in this recipe – or any of your other favorites – could not be easier as it’s formulated to measure cup for cup with sugar, so no conversion is necessary. P.S. 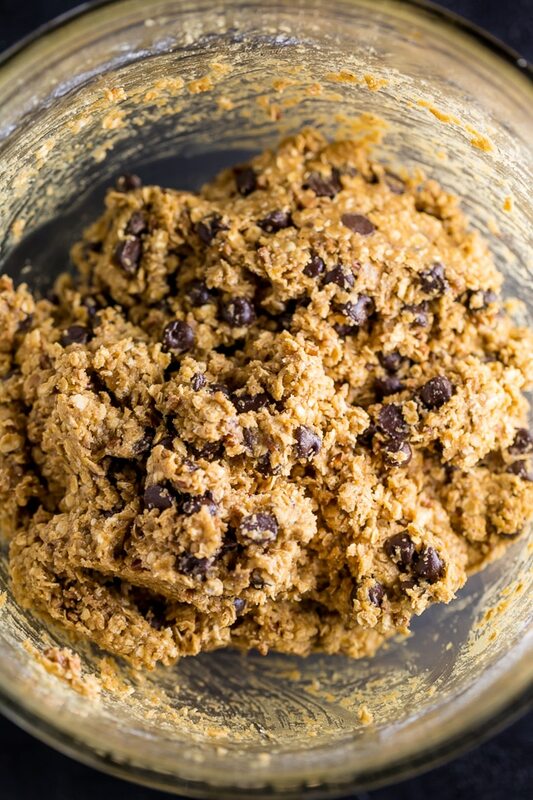 Since this recipe is vegan… you can totally sneak a bite of the cookie dough. It’s SO delicious! You can purchase Stevia In The Raw® online or use this tool to find a retailer near you. And check out their coupons and deals here. Light brown sugar may be used in place of the dark brown sugar, but this will alter the flavor slightly. And while it might seem like a tempting idea to just skip the brown sugar and use ALL Stevia In The Raw®, I must advise against it! Because brown sugar adds moisture and sweetness, it’s an essential ingredient. Be sure to check your chocolate chips are dairy free! Many brands are not. Because I know many are allergic to nuts, I wanted to note that you may omit them without making any other changes. You may also use walnuts instead of pecans, if preferred. Finally, to give these cookies incredible flavor, I added cinnamon, nutmeg, and molasses. For best results, be sure you use mild molasses and not the blackstrap variety, which is too bitter. Cheers to cookie season, my friends! 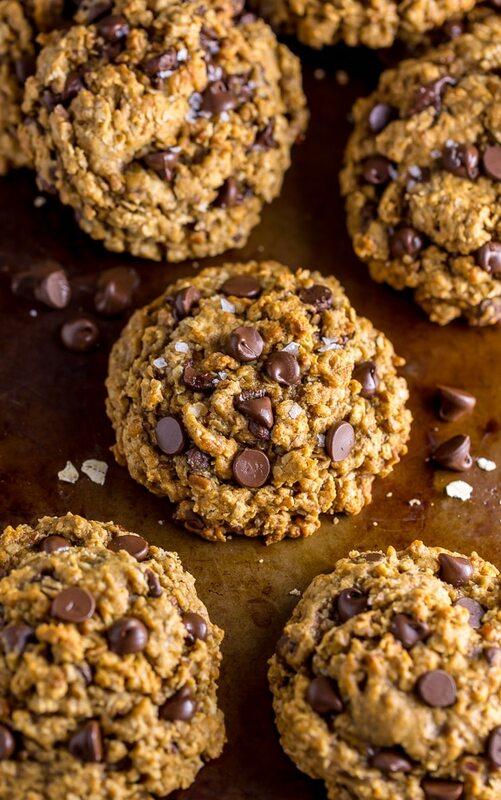 If you try this recipe for Vegan Oatmeal Chocolate Chip Cookies, leave a comment below and don’t forget to snap a pic and tag it #bakerbynature on instagram! These are the BEST Vegan Oatmeal Chocolate Chip Cookies! So thick, chewy, and flavorful! 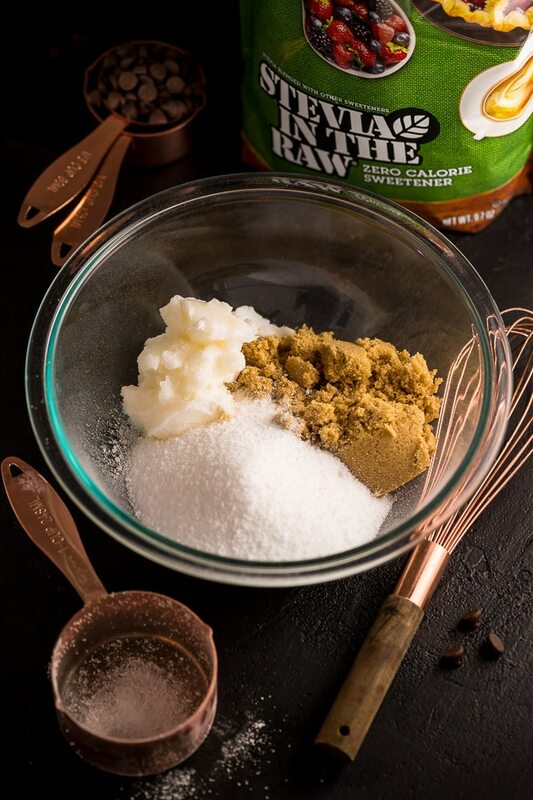 In the bowl of a stand mixer fitted with the paddle attachment, or in a large bowl using a handheld electric mixer, beat together the coconut oil, Stevia In The Raw®, and brown sugar until well combined. On low speed, beat in the almond milk, applesauce, molasses, and vanilla. The mixture will look a little grainy at this point, but don't fret; it will come together. Set aside. In a medium bowl, stir together the flour, baking soda, cinnamon, nutmeg, and salt. On low speed, gradually beat the dry mixture into the wet mixture until just incorporated. Turn mixer off. Using a wooden spoon or strong spatula, fold in the oats and chocolate chips, stirring just until incorporated. Scoop 3-inch balls of cookie dough onto the prepared baking sheets, leaving about 1 and 1/2 inches between so they have room to spread. Bake, one sheet at a time, in preheated oven for 12 to 13 minutes, or until cookies are golden and set at the edges and still slightly soft in the center. Repeat with all cookie dough. Cool cookies on baking sheet for 30 minutes before transferring them to a wire rack to cool completely. omigosh these cookies are everything, I never would have guessed they were vegan! I must share with my vegan little SIL! My dad is diabetic and i want to know if I can substitute brown sugar for something else. Can i use 2 cups of stevia instead of 1 cup stevia and 1 cup brown sugar? i made today your vegan chocolate chips – you said in your recipe you do not recommend changing ingredients. I guess in that one i cannot replace the sugar? Hi there, can you use other sweetener than Stevia? I used unrefined organic coconut sugar instead of the brown sugar and organic cane sugar in place of the stevia.